An 18-year-old Baltimore rioter who smashed a police car window during heated protests against the death of Freddie Gray, and then turned himself in, has been set a bail of $500,000 – more than any of the six police officers charged in Gray’s murder case. The cost of freedom for those inside and outside the US justice system is strikingly different, recent Baltimore events have shown. The facts are simple: Caesar Goodson, a 16-year veteran of the Baltimore Police Department has been charged – among other things – with second-degree murder in the case of Freddie Gray. His bail has been set at $350,000. All six officers involved in the arrest of Freddie Gray and detained in connection with his murder have been released on bonds of between $250,000 and $350,000. 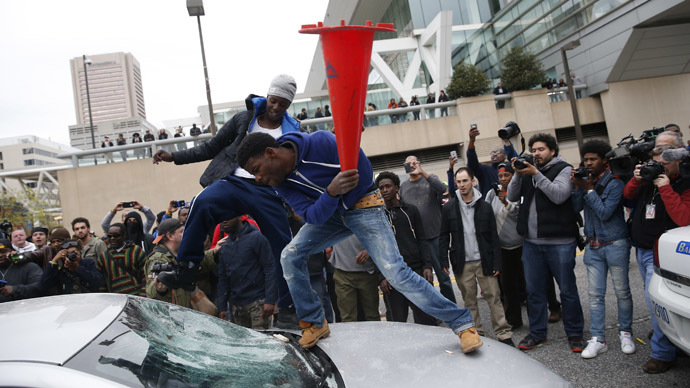 On the other end of the scale is Allen Bullock, an 18-year-old who turned himself in after vandalizing a car with a traffic cone during last week’s protests-turned-riots in Baltimore. Bullock’s bail is set at $500k, according to the Guardian. When it comes to the charges that both men face under the State of Maryland penal system, they too face criticism on a sliding scale. Goodson whose alleged involvement in Gray’s death eventually sparked protests and violent riots, faces six charges. The highest one is the “second degree depraved heart murder,” that carries a maximum sentence of 30 years in prison. Bullock on the other hand was charged with eight criminal counts, including rioting and malicious destruction of property. He could face a maximum sentence of life in prison, if convicted in Maryland. The fact that the young man turned himself in did not influence the judge's decision to severely punish the teenager, or make an example case out of Bullock’s misconduct. Apparently only one court heard the cases of those arrested in riots on Saturday April 25. The workload was so intense that, allegedly, the court heard up to a dozen cases an hour and set bail. Obviously the low-income family has no means of affording a half-a-million dollar bail. According to the Guardian, Bullock made a bit over $15k last year. The incident did not go noticed on social media, with users voicing complete shock over the unfairness of bail and the state’s penal system. The US and Baltimore in particular have been gripped by protests over the death of Freddie Gray while in police custody. The latest series of protests are part of the “Black Lives Matter” protests that have stormed the nation in the wake of the murders of African Americans at the hands of police in Ferguson, New York, and Cleveland.